« Flamies Nomination- Vote for Crochet Adorned! I am really excited about this one, even though I know it will take me a while to get around to sewing it up. 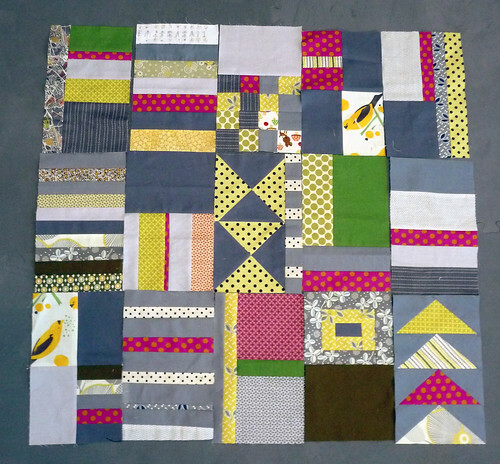 Our group has had its struggles keeping up and staying involved, but I am thrilled with the blocks that have been sewn so far. It has also been a fun opportunity to sew with lots of fabrics and color combinations that I wouldn’t necessarily choose, and those challenges, of course, encouraged me to “think outside the box.” My main hope was that joining the bee would make me sew something every month, in the midst of other deadlines, and it did help me to do that. I can’t wait to get the rest of the blocks! This is going to look so great after you stitch it up! Wow Linda its awesome! I cant wait to finish mine!! It's great to see all these blocks together! I'm really looking forward to making mine. Since you like the triangles I just might have to make some more! I have one more block for Chawne to do and then yours are next. Your fabric selection is really awesome and it's going to make a great quilt!